Did you know that once the rubber wears out on these clamp pads, Sioux Rubber & Urethane can recover them back to original condition with a higher quality rubber for the application? There is no need to buy a completely new set. 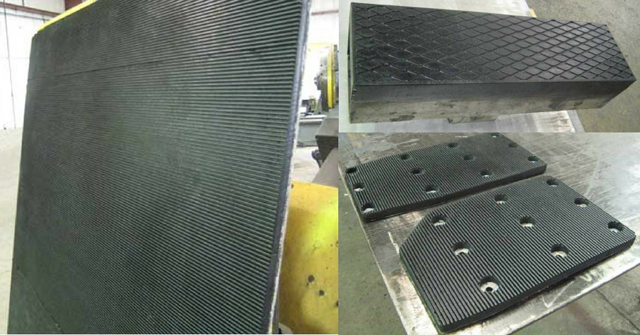 Having clamp pads recovered by Sioux Rubber & Urethane saves money, downtime and makes them last more than twice as long. Here’s a great example to showcase this type of savings: a customer wanted to know what it would cost to buy a brand-new clamp pad versus what it would cost to recover existing pads. It cost $200 less to recover FOUR clamp pads than to buy TWO new complete pads, said Derek DeGroot, Sales Manager. And the process is simple to do. Turnaround time is two to three days, compared to weeks if a new part must be made. Sioux Rubber & Urethane ships nationwide and to Canada. If you’re interested in seeing how much money you can save by recovering clamp pads, contact Derek or Jordan directly.